Weekend One of the 2015 Austin City Limits Music Festival, now in its 14th year, begins on Friday, October 2nd at Zilker Park in Austin, Texas, and Red Bull TV will broadcast select sets starting at 2 PM CT.
Be sure to visit this page throughout the weekend to watch your favorite artists perform across three separate channels, thanks to Red Bull TV. The schedule of performers (subject to change) is listed below. Follow Red Bull TV and Speakers in Code on Twitter for updates. 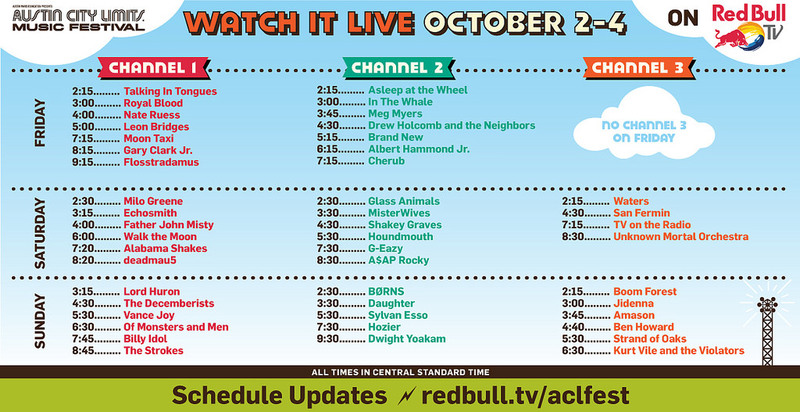 8:15pm - Gary Clark Jr.
6:15pm - Albert Hammond Jr.